Certainly great women artists have given us much in the way of enduring art. But their contributions are great, not because they are women, but because the work itself is great; and generally speaking a concern of mine is that the emphasis will fall on the woman artist, rather thatn on the art itself. Women artists should be artists first, and women artists second. 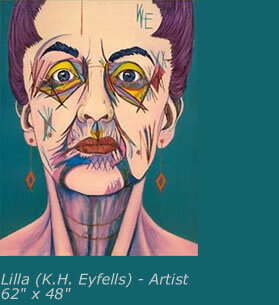 fortunately Kristin Halldorsdottir Eyfells, born and raised in Iceland, is an artist first. With a degree in psychology (she took a sculpture class, and the rest is history), she has always had an interest in people; expecially how they look. In Iceland, she designed and sold women's clothing; she stitched and hemmed pieces of colored fabric into objects of beauty. Today her fabric is her canvas stretched onto wooden frames, on which she renders a timeless subject--new interpretations of the human face.